Fine Turf Services have a whole range of equipment to carry out shallow brushing, whether this be pedestrian operated for use by the clients in-house staff or specialist equipment used by trained and experienced operators. The need for regular shallow brushing is highly recommended within a routine scheduled maintenance programme to help preserve the quality of the synthetic surface. These routine works help to keep carpet fibres upright and continually re-distribute the infill to both keep the correct levels and help prevent compaction and hardening of the upper carpet pile. 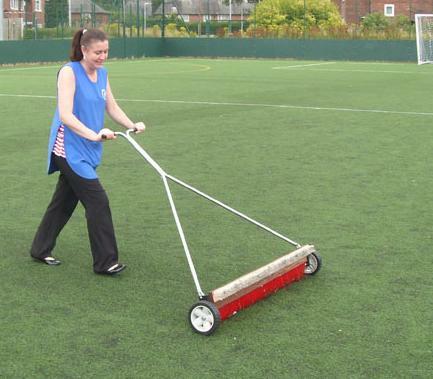 Regular brushing or drag matting is an essential maintenance requirement which will be invaluable to the upkeep of the artificial surface. Fine Turf Services can offer varied options to clients, mindful of keeping within budget restraints whilst still ensuring a quality maintenance regime for facility managers.